The new double album "Stadium Arcadium" from the Red Hot Chili Peppers and concert tickets for the band's North America tour will be offered through an exclusive pre-sale on the iTunes Music Store (www.itunes.com). 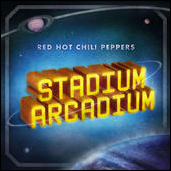 Customers can pre-order "Stadium Arcadium" from iTunes for $19.90 to be downloaded on May 9 when it is released. The band and iTunes have teamed up with Ticketmaster to offer a special concert ticket pre-sale for their upcoming North American tour. "The Red Hot Chili Peppers' fans are going to love the combination of music, video and even concert tickets available on the iTunes Music Store," said Tom Whalley, chairman and CEO of Warner Bros. "This is the first Red Hot Chili Peppers album in over three years and we think music fans are going to be delighted with what we've done with Apple." "This is an incredible offering for fans of the Red Hot Chili Peppers," said Eddy Cue, Apple's vice president of iTunes. "We've put together a package that's unrivaled in the music industry for launching a new album, exclusive videos and a concert tour." Customers can pre-order a copy of the band's new double album, "Stadium Arcadium" for $19.90 to be downloaded on May 9 when it is released. Fans that pre-order the double album will receive a download of the new single, "Dani California" immediately at the time of the pre-order. On May 9, fans participating in the pre-order will also receive additional iTunes bonus content, including an exclusive audio interview with the band, a video chronicling the making of "Dani California" and a full color digital booklet. The band and iTunes have teamed up with Ticketmaster for a special concert ticket pre-sale for their upcoming North American tour. Fans who pre-order the album on iTunes will also receive an email with a code that they can use at Ticketmaster.com starting May 9 to purchase concert tickets before they go on sale to the general public on May 13.